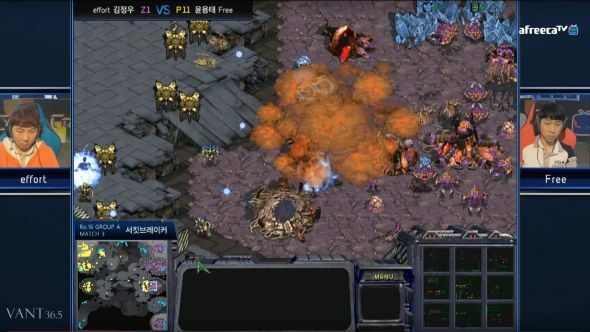 StarCraft: Brood War is the best eSport of all time. It’s also almost impossible to play due to late-90s interface and control design that feels as outdated now as its sprite art and 640*480 running resolution. Thankfully, the very best of the best never stopped, and 18 years after release, 16 since professional play began being shown on TV in South Korea and four since StarCraft II supposedly killed it off, major tournaments have once again begun filling studios and Twitch streams with fans. The ASL Season 1 is running in tandem with the StarCraft II GSL and with group stages finishing tomorrow it’s already been an incredible tournament. Looking for some more playable strategy games for the modern day? Our list has the best. It’s being broadcast via the GSL Twitch stream, commentated by the unbeatable duo of Nick ‘Tasteless’ Plott and Dan ‘Artosis’ Stemkoski, along with other casters covering gaps. The group stage finishes with the next broadcast, due to take place tomorrow at 11am British / 3am Pacific. So far the games have been fantastic, with new strats, upsets and great players aplenty. Legendary names like Flash and Effort are competing, while the nearly-two-decades-old game has a few tricks yet to be uncovered as far as tactics go. To recommend just one set of games, Day 3 of the tournament has so far provided the best. If you’re interested but worried about not understanding, the commentary has been very noobie-friendly, while the game itself is massively easy to read. Even more so than StarCraft II, as units tend to spread out more and have more distinctive effects. The rest of the tournament will be spread out over August and a little into September. As always, Liquipedia is the easiest place to get information on matchups, brackets and timings.